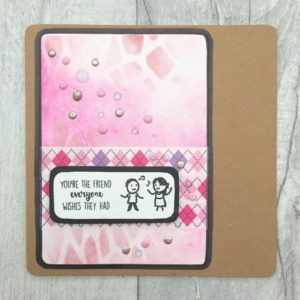 Hello there, and welcome to my first card tutorial post as a member of the Mama Makes Design Team. 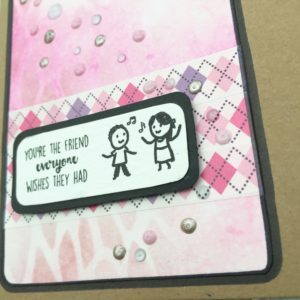 To create this card, I used two stamps from the Mama Makes Forever Friendship Stamp Set, which is available from their shop for £9.99. If you’d like to recreate this card you will need. To begin, I used Stazon black ink to stamp my sentiment and image onto the piece of small white card. Once the ink had dried, I used my corner punch to round the corners. Using my tape runner, I mounted this onto the slightly larger piece of black card, which I cut to size using my trimmer. Finally, I rounded the corners with my punch. For the background, I taped the larger piece of white card down on a clipboard and then taped my stencil over the top. With my ink applicator, I applied Victorian Velvet distress ink through the stencil varying the intensity of the colour to create interest. After removing the stencil, I added a layer of Picked Raspberry around the middle area. To ‘distress’ the ink, I misted on some water and left it a moment before mopping it up and leaving the card to dry. You can use a heat tool or hair dryer to reduce the drying time. Next, I lined up three strips of washi tape across the card about a third of the way up. I chose this tape because it went well with the distress inks I’d used. 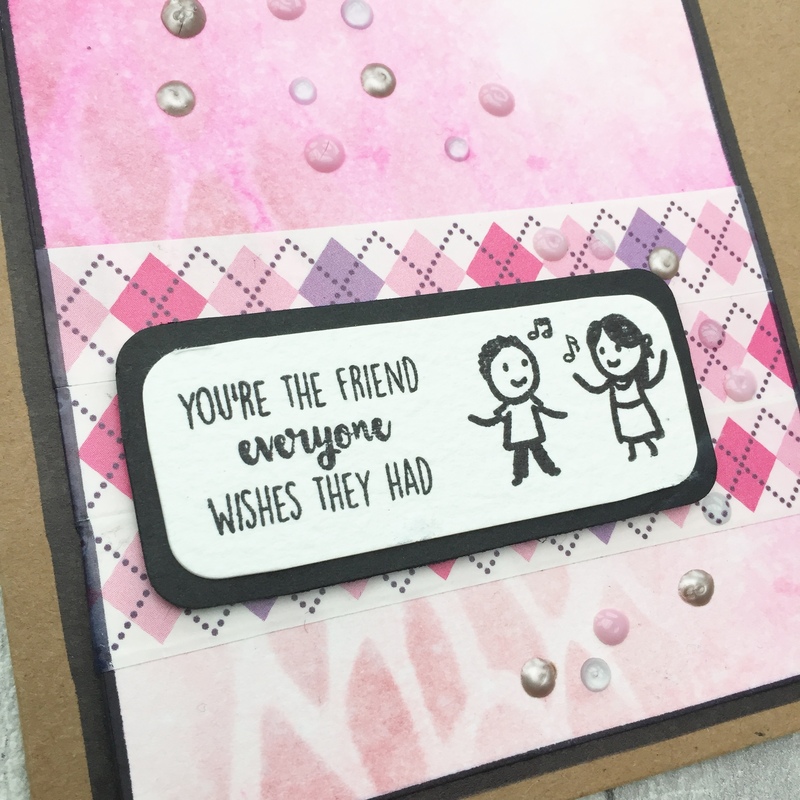 I attached the sentiment piece to the front of the card using foam squares so that it stood out and added dimension. After taping the whole piece to the front of the card, I decided it didn’t quite pop enough, so I ran a permanent black marker pen around the outside to create a border. To finish the whole thing off, I applied dots of Nuvo Drops in a swoosh around the sentiment piece. This added some glitter and shine and a little extra dimension. So there you have it! Do pop along to the Mama Makes Store and have a look at their stamps. They’re lovely. I can’t wait to make some more cards with mine! I received the Forever Friendship stamp set for free, as I am a member of the Mama Makes Design Team.